Dr. Nnanna is an economist and a Central Banker. He has three decades of post qualification professional experience. He attended William Paterson University in Wayne, New Jersey and University of Houston, in Houston Texas, USA from 1975-80, where he read Finance, Public Policy and Economics. He graduated with B.A, M.A and PhD diplomas. Since graduation, Dr. Nnanna has attended several economic policy oriented training programs. In 2003 and 2004, he studied at Harvard University and participated in the macroeconomic policy and leadership/ organizational management training programs. Dr. Nnanna was appointed Deputy Governor (Financial System Stability) Central Bank of Nigeria on February 3, 2015. His work experience includes: a brief period of teaching at the University of Houston at Clear Lake City campus (USA) and at the federal government Polytechnic, Akure (Nigeria) in 1980-82. And from 1982-1989, he worked as a staff economist in the international trade and exchange rate section of the Research Department of the Central Bank of Nigeria. Dr. Nnanna also served as full time consultant to the government of Nigeria as a technical assistant to the National Economic Management Team and the Presidential Steering Committee on Global economic crisis. He was also a part-time consultant to the United Nations Conference on Trade and Development (UNCTAD). 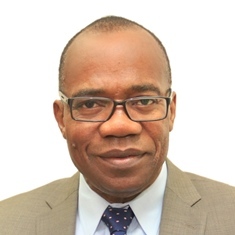 In 2012-2014, Dr. Nnanna , served as the Alternate Executive Director, representing Nigeria and 21 other sub-sahara African countries on the Board of the International Monetary Fund (IMF), Washington D.C.
Seyi Bickersteth is the National Senior Partner of KPMG Professional Services, Nigeria; he oversees KPMG West Africa Region and is a Member of the Global Board. Seyi has provided advisory services to major companies in varied industries, including oil and gas, financial services, telecommunications, manufacturing, commercial, public sector and not for profit organisations. He has been extensively involved in privatisation activities and has provided tax and business advice to several local and international companies on privatisation, business organisation, entity restructuring and business regulatory issues. Seyi was a member of the Trade and Investment Committee of the Nigerian-American Chamber of Commerce; was a director of the Nigerian-South African Chamber of Commerce and currently a Director of the Nigerian Economic Summit Group. He was also involved in Vision 2010, which prepared a memorandum on the vision for Nigeria by year 2010. He chaired a working group on “Nigerian Tax Reforms 2003 & Beyond” for the Federal Government of Nigeria. Ken joined Price Waterhouse in London in 1978 and moved to PwC Nigeria in 1988. He became the Country Business Executive Leader of PwC Nigeria and West Africa and was a member of the PwC Africa Executive Committee. Ken holds a B.Sc. (Eng.) degree in Mechanical Engineering from Imperial College, London University, and over 36 years’ experience in the provision of assurance, taxation, business advisory, and consulting services. He specialises in strategy, enterprise transformation, process reengineering, taxation advisory and business reconstruction. He is a Member, the Institute of Chartered Accountants of England & Wales, and Nigeria; Member, City and Guilds Institute London; Member, Chartered Institute of Taxation of Nigeria, and Member, Business Recovery & Insolvency Practitioners Association of Nigeria. Funke was Chief Financial Officer of Tiger Brands Limited from 2011 to 2016. She held the position of Chief Financial Officer of Primedia (Pty) Ltd, from 2001 to 2011. Prior to 2001, she was Managing Director of a private equity firm, Kagiso Ventures Limited and Executive Director of its parent company, Kagiso Trust Investment Company. Funke also worked in the corporate finance division of Standard Corporate and Merchant Bank. She trained and qualified as a Chartered Accountant with PricewaterhouseCoopers in London, where she spent a total of 10 years in audit and tax. She is a Fellow of the Institute of Chartered Accountants in England and Wales. Boye Olusanya, the new CEO of Etisalat Nigeria is bringing on board an impeccable wealth of experience from the Nigerian telecoms sector. At ECONET Wireless, he was Deputy Chief Executive Officer and subsequently the Acting Chief Executive Officer where he successfully managed the affairs of the Company after the disengagement of the former operators. At CELTEL NIGERIA LIMITED, Boye assumed the role of Deputy Chief Executive Officer and led the business strategy initiative for data services as well as key strategic operational changes in the business. Boye has handled high level responsibilities at Dangote Industries Limited where he served as Chief Business Transformation Officer responsible for management of all enterprise-wide projects in the Group. He was also MD at Dancom Technologies Limited with responsibility for managing all the telecom assets and the IT Infrastructure. He oversaw the sale of the 3G subsidiary as well as managed the rollout of the fibre backbone network covering 4400km across the country.